“Vale, the world’s largest iron ore miner, reported record net profit for last year as demand remained strong in China and nickel volumes recovered. The company on Thursday said it earned net profit of $17.26bn in 2010, more than three times what it made a year earlier, as sales reached $46.48bn, nearly double the $23.94bn of revenue in 2009. Revenue for 2010 is 21% higher than the previous record of 2008. EBIT, EBITDA and Net Earnings are up over 30% since 2008 as the EBITDA margin increased by 6%, mainly driven by higher iron ore prices. Earnings per Share of $3.25 are on the top side of analyst expectations. The company is working on iron ore expansion projects in Carajás (Northern Brazil) and the new Simandou deposit in Guinea. Apolo (Brazil’s Southeast system) and Carajás Serra Sul are further down the line of expanding production, planned to be delivered in 2014. 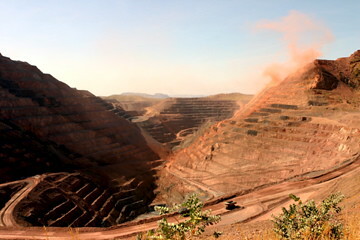 Ferrous minerals accounted for 92% of adjusted EBIT over 2010, showing the company’s large dependence on iron ore prices. Expansion for non-ferrous commodities mainly takes place outside Brazil: Mozambique’s Moatize coal project; Zambia’s Konkola North copper project; Argentina’s Rio Colorado fertilizer project; and Peru’s Bayovar fertilizer expansion signify the increasing international presence of the company. The improved gross margin of the company does not indicate it has costs under control, but mainly that prices were higher. Vale did not suffer from exchange rate fluctuations as much as its peers as most of its costs are incurred in currencies linked to the dollar, but it mentions cost pressures in the areas of depreciation (resulting from expansion of the equipment fleet) and in procurement. Cash position of $10bln at the end of 2010 and the outlook to beat last year’s cash flow from operations of $20bln in 2011 gives Agnelli a lot of flexibility in expanding. Vale will have to use the pile of cash to build a sustainable position among the supermajors even if iron ore prices come down. As the senior management indicates no major acquisitions will be done, the company will focus on organic growth (33 projects to be delivered by 2015) to achieve this objective. When presenting the results no mention was made of election of a new CEO for Vale. Reelection of Roger Agnelli when his current term ends in March is not fully certain as tensions with the government are mentioned. Henrique Meirelles, Brazil’s former central bank governor, and base metals chief Tito Botelho Martins would be potential candidates to succeed him. The decision will have to be made by the powers behind Vale: the Brazilian government, Pension fund Previ and Banco Bradesco, and Mitsui. The acquisition has been rejected because of unclear benefit to the country. BHP has 30 days convince the government of the net benefit for Canada of the transaction. The main issue for the Canadian provinces is the prospect of reduced tax revenues. Additionally, the government will require additional certainty about the security of jobs. The rejection should not be interpreted as a final decision, but rather as a logical way of pressuring BHP Billiton to be more generous to the Canadian government in conceding securities. The company will most likely come with a counteroffer that is hard to reject with the argument of negative ‘net benefit’. If the company manages to convince the government, it still has to persuade shareholders to sell the shares. Most likely it will have to increase the price by approx. 10 percent to gain enough support. However, the actions of other parties like Sinochem and Phosagro might force the company to back off, as a bid above $150 could not be explained to BHP’s shareholders. “Sinochem, the Chinese state-owned chemicals group, is trying to recruit at least one sovereign wealth fund and a Canadian pension fund for a consortium to block BHP Billiton’s $39bn hostile takeover of PotashCorp of Canada. Sinochem is reported to try to form a consortium to buy a strategic stake of PotashCorp to prevent BHP Billiton from acquiring the company. The Chinese company, backed by the Chinese government, is said to be afraid the targeted position of BHP would decrease stability of the fertilizer supply to China, which is crucial for the food security in the country. Chinese firms appear to use the strategy of buying 10-20% stakes of companies that are about to be acquired in order to prevent the acquisition in case the deal is thought to be harmful to Chinese interests. Using this “divide and conquer”-strategy, Chinese firms try to limit the negotiation power of their suppliers. The advantage of state-controlled Chinese firms is the availability of large amounts of cash and the support of development banks, which helps companies like Chinalco and Sinochem to buy strategic stakes in suppliers. Clearly, the pockets of Sinochem are not deep enough to prevent the acquisition without help from other parties.